Sacsayhuaman is a walled complex near the old city of Cusco, at an altitude of 3,701 m. or 12,000 feet. The site is part of the City of Cuzco, which was added to the UNESCO World Heritage List in 1983. Sacsayhuamán is located at 4 Km north of Cusco, it embraces 3,000 hectares approximately, where a rich Andean flora and extraordinary Inca and Pre-Inca archaeological monuments as Sacsayhuaman, Kencco (or Qenqo), Puca Pucará and Tambomachay. Saqsayhuaman is one of the most amazing Incan constructions for tourists. Its Quechua name means "satisfied falcon", it was the falcon that guarded the capital of the empire, since it was possible to overlook Cusco from the hill in where it was erected. If, as it is known, Cusco was designed with the shape of a lying puma, Sacsayhuamán would be its head, and the Coricancha would correspond to the feline's genitalia. At 8:30am we’ll pick you up at your hotel and head by car to the North east of Cusco where is located the ranch. There we will meet our horses and the horseman, who will show us how to saddle and practice how to drive the horses inside the corral before to get outdoor. 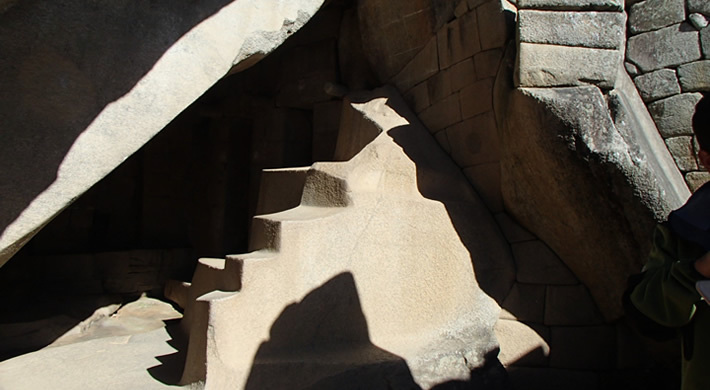 We’ll tour Sacsayhuaman Fortress first, once the site of important battles between Incan and Spanish forces. It was laid out in the shape of a Puma’s head to which the city of Cusco provided the body, and the massive blocks used in the construction confound modern visitors- some are as big as a truck and more than 50 tons in weight, with the largest weighing 120 tons. Afterwards we’ll continue on to Q’enqo (Labyrinth/Zigzag) an astronomical calendar and shrine consecrated to the Pachamama, the Inca earth mother deity, the nearby Temple of the Moon, Puka Pukara (Red Fortress), which appears to have been a military checkpoint guarding the entry to the ritual baths of Tambomachay (Resting Place), Tambomachay (Resting Place), the “Inca Baths” with its artificial waterfalls, canals, and aqueducts channeled through the terraced rocks. After 03 hours of horseback riding we’ll begin the return to Sacsayhuaman along a route known as Zone X, along rocks naturally eroded into tunnels, some bearing Inca carvings. This area is a traditional site for offerings to the Pachamama and other rituals with pre-Columbian roots due to the widespread belief that it has a magnetized energy. Entrace Fees(Half Price For Students With Isic Card).